Kisha Curtis, 29, pleaded guilty last month to fourth-degree animal cruelty on the eve of her trial. 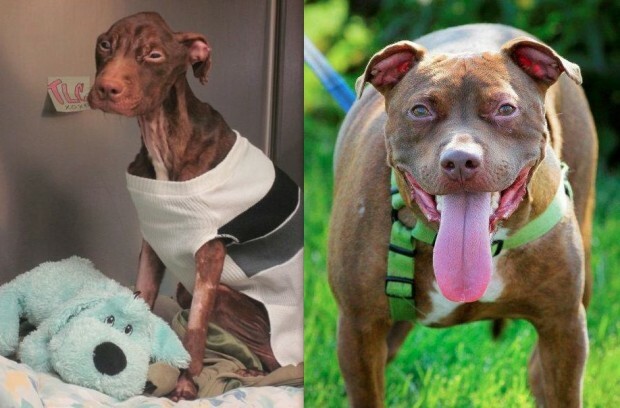 She was charged in March 2011 after Patrick the Miracle Dog was found near death. Although she won’t be serving any jail time, Curtis would be required to serve 18 months probation and forfeit her right to Patrick, who has not been in her care since he was found. She’ll also be required to pay nearly $2,000 to the New Jersey ASPCA, which gave the pup emergency care before he was moved to a veterinary hospital in Tinton Falls. Congratulations Patrick! May you be happy in your new forever home! This entry was posted in Animals Around the World, Pet Laws and tagged Kisha Curtis, NJSPCA, Patrick the Miracle Dog on August 29, 2013 by Belkis Cardona-Rivera. More than a year later, Patrick is still making headlines. New Jersey Channel 12 news reporter, Alice Gainer, was at the scene on July 9 to give us an update on Kisha Curtis, Patrick’s previous owner. Her public defendant request for another court date, which was granted. Her next court appearance is July 31st. Alice spoke to Kisha who says she still is very much hated everywhere she goes receiving Facebook threats and harassments. In addition, Alice also caught up the animal rights activists including Gwen Gurmark who was seen wearing a Don’t Be Cruel Team Patrick shirt! See the video below. Buy your Don’t Be Cruel Women’s Team Patrick shirt. 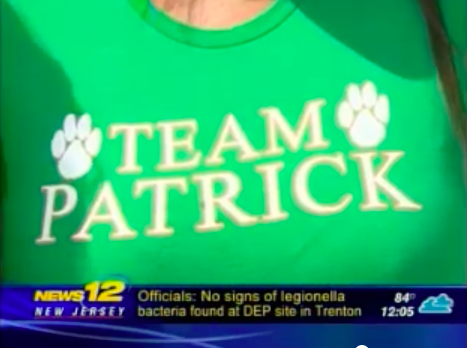 This entry was posted in Animals Around the World, News and tagged Alice Gainer, Channel 12, Gwen Gurmark, Kisha Curtis, Patrick the dog, Team Patrick women's t-shirt on July 9, 2012 by Belkis Cardona-Rivera.